A Nigerian schoolboy is vaccinated against polio during a mass nationwide polio inoculation April 12, 2005, in Kano, Nigeria. 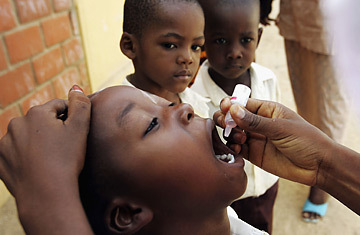 LONDON—Polio, the dreaded paralyzing disease stamped out in the industrialized world, is spreading in Nigeria. And health officials say in some cases, it’s caused by the vaccine used to fight it. In July, the World Health Organization issued a warning that this vaccine-spread virus might extend beyond Africa. So far, 124 Nigerian children have been paralyzed this year — about twice those afflicted in 2008. The polio problem is just the latest challenge to global health authorities trying to convince wary citizens that vaccines can save them from dreaded disease. For years, myths have abounded about vaccines — that they were the Western world’s plan to sterilize Africans or give them AIDS. The sad polio reality fuels misguided fears and underscores the challenges authorities face using a flawed vaccine. But it is made from a live polio virus — albeit weakened — which carries a small risk of causing polio for every million or so doses given. In even rarer instances, the virus in the vaccine can mutate into a deadlier version that ignites new outbreaks. Back then, WHO said the vaccine-linked outbreak would be swiftly overcome — yet two years later, cases continue to mount. They have since identified polio cases linked to the vaccine dating back as far as 2005. It is a worrying development for officials who hope to end polio epidemics in India and Africa by the end of this year, after missing several earlier deadlines. “It’s very disturbing,” said Dr. Bruce Aylward, who heads the polio department at the World Health Organization. Experts have long believed epidemics unleashed by a vaccine’s mutated virus wouldn’t last since the vaccine only contains a weakened virus strain — but that assumption is coming under pressure. Some experts now say that once viruses from vaccines start circulating they can become just as dangerous as wild viruses.